Welcome to the projects page! This page lists links to the pages of projects past and future. Stay posted for updates! Sometimes, HUGE projects get worked on in the Blimp Room, requiring huge amounts of time and materials. We are currently planning the best way to renovate the Blimp Room, our in-house project space, to make it project and work-worthy! 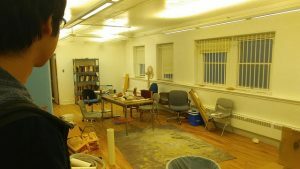 Currently, we are seeking sponsorships from companies, compiling a list of the tools, materials and furniture we need, and creating a 3D model of the new space. We are also preparing a proposal to submit to interested parties. Miranda Cravetz, Nicoleta Mahu, and Erin Brown work on their prize-winning Rube Goldberg machine. 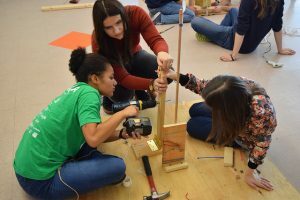 Rube Goldberg is a fun, exciting competition where creative minds design and build contraptions that accomplish a simple task (such as squeezing toothpaste out of a tube) in an complicated fashion. The JFP is an annual fellowship that funds three projects for up to $1,000. Click the link to read more about the background, application and deadlines! 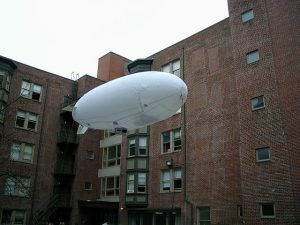 Back in 2001, the legendary Blimp project took flight! Originally founded by STWing alumni Benjamin Tang and Michael Bruni, this project aimed and succeeded in the construction of a thirty-foot blimp capable of carrying a ten-kilogram payload. Current organizers of the blimp project are Parliamentarian J. Spencer King (Executive Director), Vito Sabella (Technical Director), Scott Currie (Computer Director), and Diana Hong (Business Director). Faculty organizers include Dr. Krimo Bokreta (KC/EH House Dean), Dr. Jorge Santiago-Aviles (KC/EH Faculty Advisor and Electrical Engineering Advisor), and Dr. James P. Ostrowski (Mechanical Engineering and Computer Information Science Advisor). PennScience is committed to promoting and raising the visibility of undergraduate research. Doing research has become a standard part of many science majors, and many students go above and beyond the call of the minimum requirements, spending long hours and even summers in the lab. Some even begin their research careers while still in high school. Yet too often, this work goes unnoticed and unreported. By creating a scientific forum for and by students, we hope to bring together young researchers, helping to make students feel that rather than participating in a disjointed and isolating endeavor, they are becoming a part of a true community of scholars. We also seek to raise the awareness of the outside community to research performed by undergraduates. 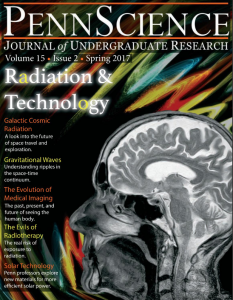 A key goal of our journal is to make publication more accessible to college and high-school students, providing a peer-reviewed journal dedicated solely to their work. Publication in academic journals is a time-consuming process which is not always suitable for the duration and scale of projects done by undergraduates; we seek to create another option will allow more students to publish their research. Science is not something which exists solely in a lab, cloistered in academia and separate from society. Our everyday lives are affected by science at a myriad points; medicine, science, technology, politics and society are intricately and intrinsically intertwined. This journal is, ultimately, a testament to the fact that what student researchers are doing is not simply completing their independent study projects. They are participating in the creation of new knowledge, the building blocks upon our ever-evolving understanding of our world rests; and that this is an endeavor to be publicized and celebrated.